Our shuttle service from Miami to Fort Myers run every day. Everyone knows that Florida is the main cause of attraction for tourists and visitors coming to USA on a vacation because it has so much to offer. Countless travelers choose our Miami to Fort Myers shuttle services because it is a simple and most affordable way of ground transportation within the state. By simply selecting the type of transportation service you need from Miami to Fort Myers, you will get an instant quote. Our operators, dispatchers and drivers are trained well and are consistent in providing you the best possible services. Our daily Miami to Fort Myers shuttle service offers a comfortable transportation service to many cities we serve in the state of Florida. It is the most economical way of getting a transportation services within the state with ease and comfort together. It runs daily in the mornings and afternoon. Our Miami to Fort Myers private transfers is one of the best options to travel to any of your desired destination in the state of Florida. It offers you a pick up and drop off at your desired time and place. It is a smooth and most comfortable way of transportation without making any stop on the way. Our shuttle services offer intercity transfers between Miami and Fort Myers and all other major cities we serve in Florida. 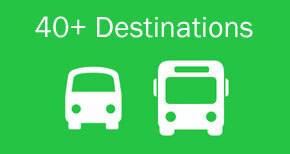 It allow us chance to serve as many destinations then any other ground transportation company can provide in the state. Different shuttle service providers departs an hour later or earlier while traveling from Miami to Fort Myers depending on where from you will be getting picked up. There are several locations of departure from Miami which are: Miami International Airport (Regency Hotel) and Miami Downtown (Holiday Inn Hotel) in front of the Bay Side marketplace. The Miami to Fort Myers travel time is between 2 to 21/2 hours depending on the traffic situation as well as travel route. When heading towards Fort Myers from Miami by using our transportation service, you will be taking the following route: i-75. Keep in mind that the above routes depends on the trip you choose. Our Miami to Fort Myers shuttle bus runs daily to the West Coast of Florida, passing through Naples, Punta Gorda, Bonita Springs, St Petersburg, Sarasota, Port Charlotte, Bradenton, Tampa. We do offer a door service with our shared shuttle bus, but only in Miami and not in Fort Myers. However, for Miami door to door service, the mileage limitations apply. If your desired address for the pick up/drop off is exceeding from the allowed limit of pick up/drop off main station radius which is (3 miles), we will choose the closest main station for your convenience and will inform you via e-mail a head of time. Any questions regarding the Miami to Fort Myers shuttle door to door transportation service, please get in contact with us and one of our travel specialist will be able to assist you. Thank you! Miami to Fort Myers Travel Guide for tourists, visitors and local residents. A big number of travelers and visitors from all over the world comes to Florida every year for different reasons due to a fact that it has so much to offer such as: wonderful theme parks, beautiful lakes, eye catching places and of course the amazing beaches. Numerous locals also love to visit different places for a day trip or a perfect getaway within the state. There are many great places to visit in Florida. We recommend you to visit the Miami Official site and Fort Myers main portal, if you are planning for a vacation there. You can also take a look at our Travel Blog below for more information. Enjoy and Bon Voyage!